It sounds obvious to say that what learners want should be at the heart of what organisations’ L&D teams deliver for their colleagues. But not so, according to the Towards Maturity Benchmark, whose managing director, Laura Overton ran a webinar last week on What learners want for the Learning and Skills Group. 63% of organisations say their learners can’t mange their own learning. Participants on the webinar said they needed to do more to find out what learners wanted and to excite them about what their organisations offered. 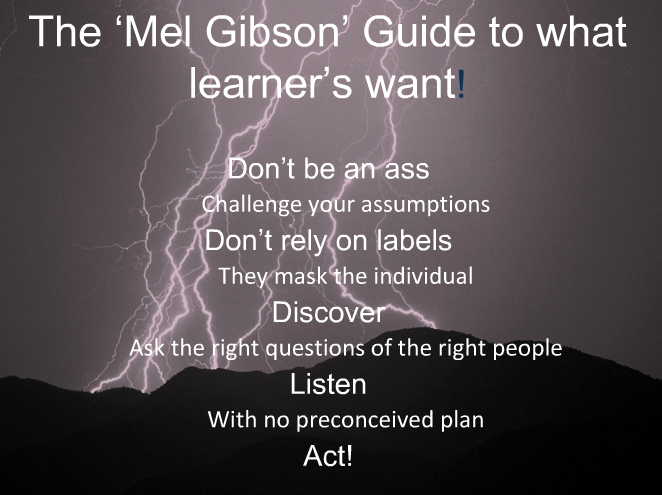 Which was just as well, as Overton ended her talk by sharing the Mel Gibson guide to what learners want (see image).